This podi is as basic as salt and sugar in a south Indian kitchen. 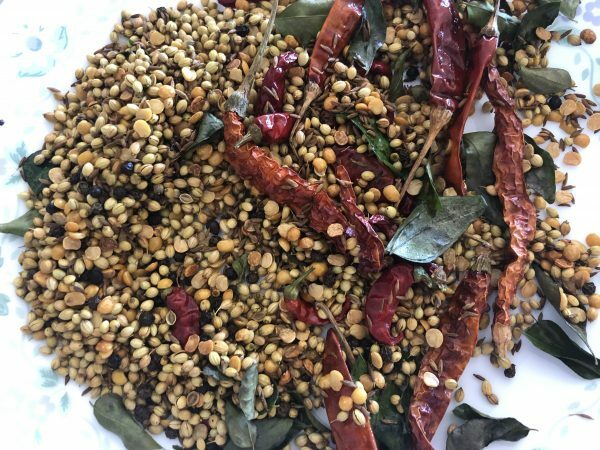 Rasam, the soupy dish, that probably tops the list of comfort foods to most South Indians, or at least in our family, can be ready in as little as 15 minutes if you just have this foundational ingredient. A good rasam powder makes or breaks the deal. I remember my own mother once went through a bad patch where the rasam was just awful and it was the podi's fault (podi = powder in Tamil). We complained every day until we got a new, better batch and she redeemed herself. Whenever we travel, the first thing, actually, the only thing, I want is a cup of hot rasam and steaming white rice. I used to get the podi from my mom until a few years ago, but have now started making my own. Not just making my own, I now supply to my kids! It felt like a rite of passage when I started to pack/send rasam podi for my kids. 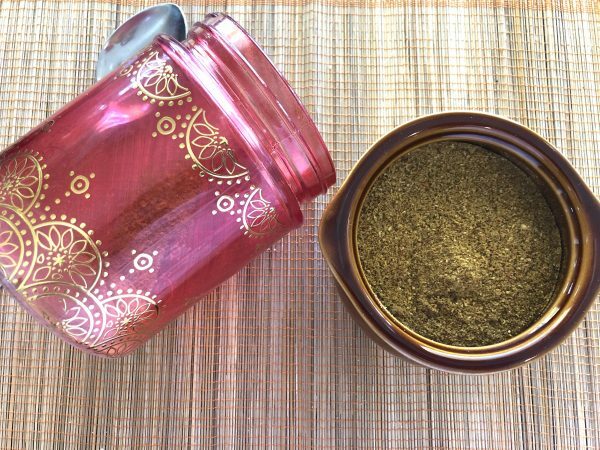 Rasam powder's flavor comes from just a few basic ingredients every pantry should have. While my rasam powder does not lack in flavor or freshness, I just don't seem to get the color that we get back home. The main reason being I don't use whole turmeric pieces, and then I also add curry leaves which makes the color a bit dark. 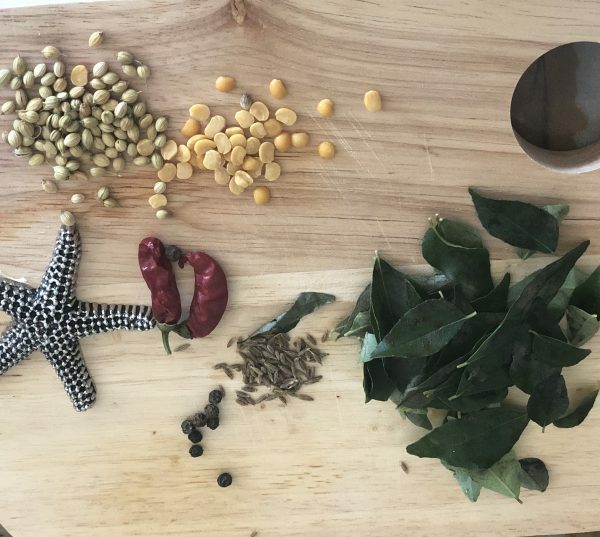 But the flavors more than make up for the color, and I get good looking rasam with fresh bright juicy tomaotes, and turmeric powder added while making the rasam. On to the recipe now! Store in an airtight container for upto a month/two for freshness and potency. Try making the rasam powder in this quantity, so it stays fresh. If you make a lot, freezing it would likely preserve freshness and potency, but I always make roughly this quantity and it lasts me about a month or so, depending on how frequently I make it. 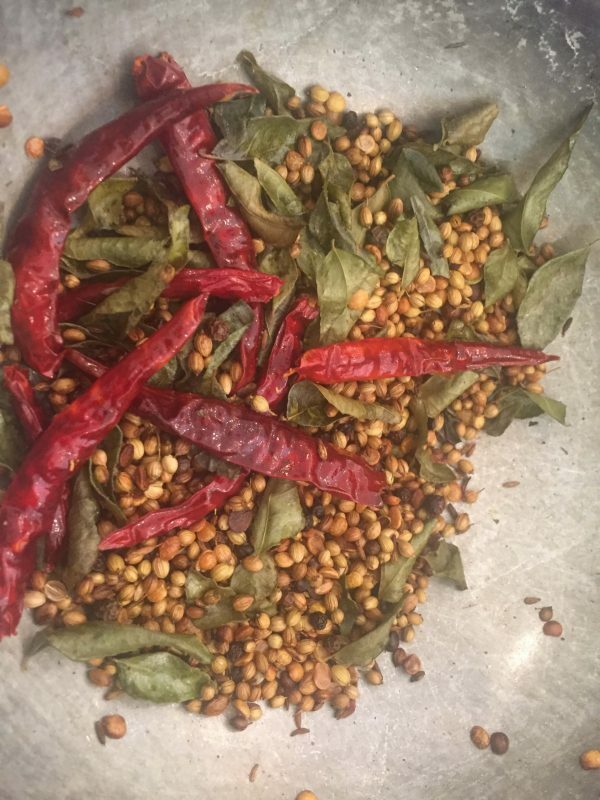 I generally use roughly 1 tbsp of this rasam podi to make about 2 cups of rasam. It may seem like a lot, but my rasam is tangy with the tamarind and the tomatoes, so we need the heat and the flavor of the spices. 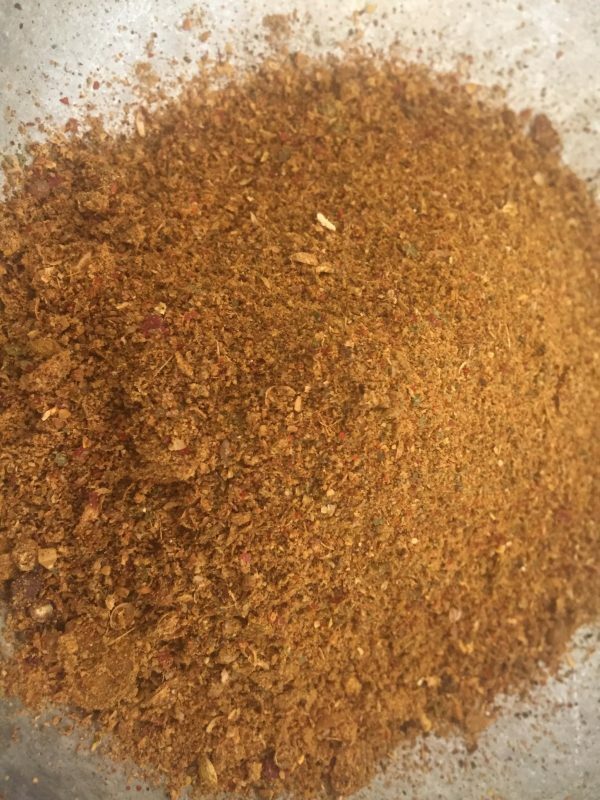 The podi can also be made with no oil at all, I just use a minimal amount to fry the spices. 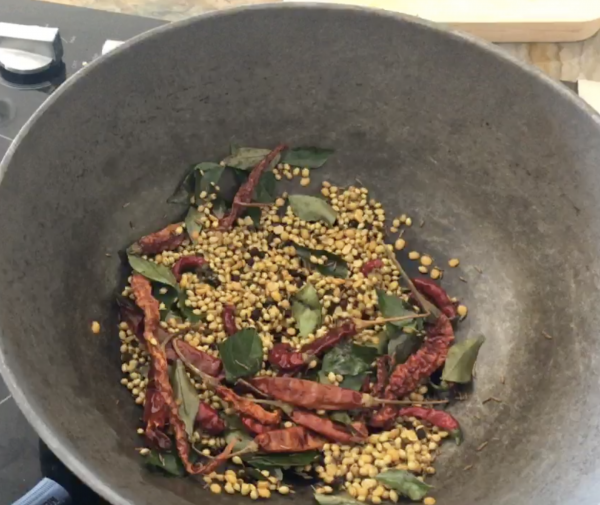 Since the spices are basically fried and then powdered, they don't need simmering in the rasam for a long time, and once the tamarind base loses its rawness, about 5-8 minutes, your rasam is pretty much done! In fact, cooking for too long would change the taste of the rasam completely and it would get a very concentrated taste. I know, because I used to simmer my rasam for hours in my early days of learning to cook! And then wonder why my rasam tasted so strong and concentrated! You can also make this podi for just one serving. Use about 1 tbsp of coriander seeds, and adjust all the other ingredients. The fresh podi tastes amazing if you fry the spices in a few drops of ghee instead of oil. With the red chilies, use as much or as little as you like, as the heat is determined by the variety. In general, the guntur red chiiles (the fat round ones) are hotter than the long red ones, but then, the current batch of long red chilies I have is super hot. With this rasam podi, you're well on your way to passing the South Indian rasam test. Good luck! Basic Rasam Recipe using this podi.